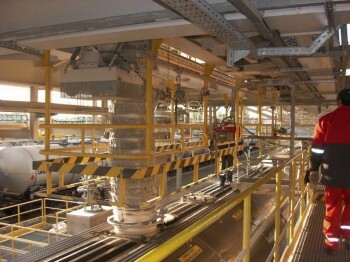 A company of the petroleum industry was looking for a suitable drive system for a safety railing. This 6m long handrail is lowered during the filling of the tanker to prevent that someone is on the tanker while it is being filled with fuel. For reasons of environmental protection they wanted to dispense with a hydraulic-powered solution. According to customer requirements ATLANTA designed a drive system with TS5 standard screw jack gearboxes in the version with non-rotating spindle. Due to the size of the railing, four TS5 gearboxes were used. The TS5 with a ratio of i = 4: 1 included a Tr18x4 trapezoidal spindle in the length 355mm. Because of the explosive atmospheres, the TS5 had to be mounted according to the ATEX requirements. In order to supply the four TS5 standard screw jack gearboxes permanently with lubricant, electronically controlled lubricator were connected to each TS5.